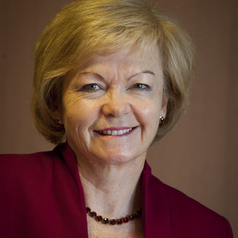 Professor Jane den Hollander commenced as Vice-Chancellor and President of Deakin University on 19 July, 2010. Since that time Professor den Hollander has set out to develop a clear vision for Deakin that distinguishes it from other universities. For the students and staff who choose Deakin, her concern has been to set a value proposition that is different, that is aspirational and which reflects the place Deakin wishes to be for the communities the University serves. Professor den Hollander is currently a Director of the Geelong Performing Arts Council Trust, a board member of Universities Australia, Education Australia Limited, the newly established Strategic Advisory Committee of the Office for Learning and Teaching (Australian Government); and UniSuper Limited and UniSuper Management Pty Ltd. Professor den Hollander holds a BSc and a Master of Science degree from Wits University, Johannesburg. Her PhD is from the University of Wales, Cardiff. Prior to taking up her appointment as Vice-Chancellor of Deakin University, Professor den Hollander was Deputy Vice-Chancellor (Academic) at Curtin University of Technology in Western Australia.